Home Improvements To Lower Your Utility Bills! Do you ever look at your siding and think “Yuck!” ? Chances are, you probably haven’t. We all have busy lives–we’re constantly coming and going. Maybe you’re the entertaining type and have BBQs and birthday parties outside. Maybe you garden, mow the lawn, take walks around your neighborhood, but you never actually take the time to spend 10 minutes really studying your siding, trim, fascia, soffit, decking, roofing, etc. With the local heat extremities, your wood and vinyl siding is at the end of it’s life. Especially if your live neat the ocean–salt water and salt air can cause premature deterioration and decay. Promises of 10-20 year solutions are broken and the protection of your home is failing. Once you give your siding a good look, the idea of replacement can be extremely overwhelming. What’s even more overwhelming can be selecting a material that will not rot, crack, warp, color-fade, so that you don’t need to find a new solution within the next couple of years. A low-maintenance option with a 30 year warranty is a major project and a large investment that shouldn’t be made lightly. In this guide, you will find some great reasons to consider replacing your home’s siding sooner rather than later. Even in the most variable regions of New England, heating and air conditioning will have to or prefer to be used. 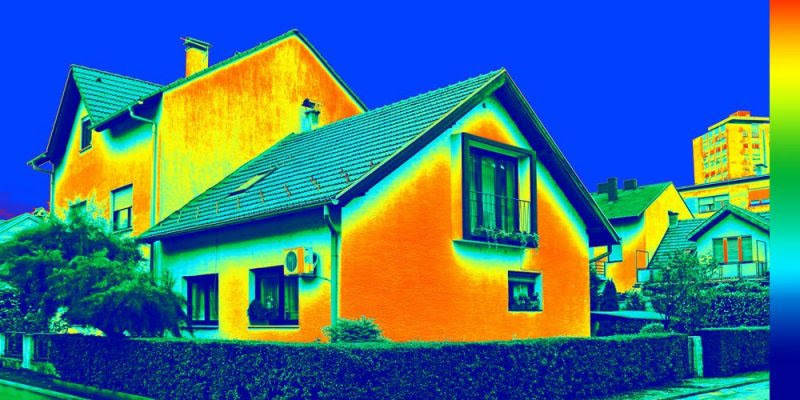 In more mountainous areas, heating bills in the wintertime can skyrocket and cooling costs can work overtime during the summer months. How can we control these costs better with siding? You’re not the only one asking this question. Siding and it’s underlaying components plays a huge role in insulating a residence. Insufficient or non-existent house wrap and window and door tape can cause a lot of home efficiency issues. There are more advanced and better solutions that keep out water, weather, and wind and better hold heat and AC. Products like Hardie House Wrap allows your house to breath to not trap in water. The average house absorbs 2-3 gallons of water every day through showers and cooking, etc. The proper amount of ventilation with vented soffits and gable vents is another area where most houses (even newer house) is failing and need to increase. Without proper amount of soffits pulling air up to your roofing ridge vent, your heating and cooling units are working over time to pick up the slack. In most cases, the roof (usually a newer roof) is baking from the inside out and aging very quickly. Vinyl options can get pinched and dinged during or soon after install. It is no secret that older, thinner siding can easily detach and allow wind and cold air to penetrate the walls of your residence and your energy costs go out the window. If your siding has come loose, you are at much more risk of water pooling and structural rot that will cause a huge amount of costly problems in the near future. We cannot stress the importance of curb appeal of an individual home and the neighborhood–especially if you plan on selling in 5-10 years. New siding can do wonders for the culture of the neighborhood and bringing incredible low-maintenance solutions for potential buyers. Whether you’re looking to benefit from a design consult and choose something entire new or stick to a similar color scheme, there are many components that can elevate the appearance of a home like brand new siding. Now is an ideal time to get on the schedule and invest in your new siding project by contacting us at Professional Building Services at 603-898-2977. Our team of experts will be there for you every step of the way, from design to putting the final nail in your siding boards. You can be assured that our crew will go above and beyond to give you the home of your dreams. We look forward to working with you! Check out some of our decking, siding, roofing, window & door projects here.